—The UNESCO World Heritage List (which so far includes 830 natural and cultural properties in the world having “outstanding universal value”) is considering adding the Campi Flegrei and adjacent area of the Bay of Pozzuoli to the list. The area is significant geologically because of ongoing bradiseismic phenomena and archaeologically because of the presence of large-scale Roman ruins (submerged and on the surface), including those of the ancient Portus Julius, the homeport of the Western Imperial Fleet. Other areas in the Campania region of Italy already on the list are the 18th-century Royal Palace at Caserta with the park, Carolino aqueduct (built by Vanvitelli), and San Leucio Complex; the Herculaneum and Pompeii archaeological sites; the Amalfi coast; and the Cilento national park (including Paestum and the Padula monastery). —What is now called “Chinatown” has mushroomed up behind the main train station and runs along the industrial port of Naples into the adjacent communities of San Giuseppe Vesuviano, Terzigno, Ottaviano, San Gennaro, Poggiomarino and Boscoreale. There are now about 800 small enterprises: wholesale stores, restaurants, grocers, small warehouses, and manufacturers of textiles, shoes, and general leather goods, etc. The Chinese community numbers about 6,000 and is represented by Si.Ci.Na (Sindacato Cinese Nazionale—Chinese National Labor Union). To some extent, the Chinese-run enterprises in Naples employ local Neapolitan labor—a big plus in a city with rampant unemployment. The bad news is that they have to pay off “the mob” to stay open. —The number of “child brides” (by definition, below the age of 18) continues to fall in Italy (from 1,562 in 1993 to 456 in 2002). Of that number, however, half (233) were in the Campania region, of which Naples is the capital. 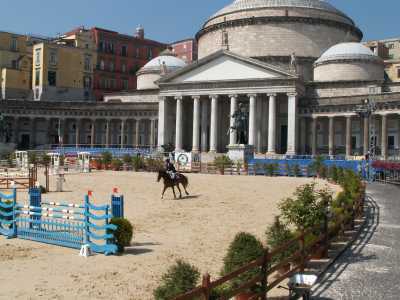 —The International Horse Jumping Competition at Piazza Plebiscito (photo, right), the third edition of which is currently underway. It’s beautiful to watch and is well attended. It’s a four-day affair. The entire square, the largest open square in Naples, is converted into a suitable venue by the abundant spreading of pseudo-earth (a high-tech mixture of chemical non-slip material) over the otherwise unsuitable and treacherous paving stones. Get a horse? Hay is not five dollars a gallon, so maybe it’s the way to go. 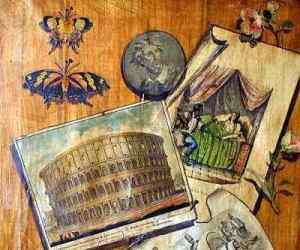 —At first, they thought it was the fault of recent rain, but apparently leaky plumbing has caused a considerable amount of water to burst into one of the most historical houses of worship in Naples, the church of Gesù Nuovo, located in the square of the same. Some damage—the extent as yet undetermined—has been done to works of two of the great names in Neapolitan (and Italian) Baroque art, Luca Giordano and Cosimo Fanzago.